George died on 8th March 1920 in Cashmere Hills Sanatorium, Christchurch, New Zealand. He died of tuberculosis as a result of exposure whilst on active service in Gallipoli. George William Batters was born on 23rd June 1890 in New Ferry, Cheshire and baptised on 3rd September, the son of Frank Harry Batters and Isabella Eleanor (Gilderoy). Frank and Isabella were married in Prestatyn on 23rd April 1889, he was the son of George Batters, Gentleman, and she was the daughter of William Henry Gilderoy, Gentleman. Frank and Isabella had three sons, George William, Frank Gilderoy and Philip Harry Bychton. In 1891 George William aged 9 months was living with his parents Frank and Isabella in New Ferry, Cheshire. Frank was a Colliery Agent. By 1901 the family had moved to Cavendish House, Prestatyn, Frank Harry Batters 43, Colliery Agent, Isabella E 35, George William 10 and Frank G. Batters 5. They had a Cook and a House Maid to look after them. Sadly Isabella died and was buried on 15th August 1903 aged 38 years. On 21st September 1904 Frank married his second wife, Elizabeth Evans daughter of Evan Evans a farmer. They had two children, Vegar, a daughter, born in 1906 and Charles born in 1909. In the 1911 census they were still living in Cavendish House, Prestatyn. Frank H. Batters, 53, Colliery Agent, Elizabeth Batters 41, George 20, Frank 15, Philip 9, Vegar 5 and Charles 2. A visitor Jane Evans is staying with them and they have one servant. Shortly after this census was taken Frank Harry Batters died and was buried on 31st May 1911. From the Probate Calendars (Index) Frank left £2,207 (a considerable amount at the time), administration to George William Batters. We know that George emigrated to New Zealand, but he can’t be found on Passenger Lists. His brother Frank Gilderoy Batters also emigrated to New Zealand, and from Passenger Lists we know that he emigrated on 18th July 1913 on the “Ionic” bound for Wellington. George and his brother Frank both enlisted in New Zealand. 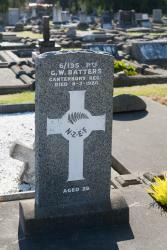 George enlisted in Nelson on 15th August 1914 and joined the Canterbury Regiment. He was 5’10 1/2″ tall, weighed 147lb, had blue eyes, brown hair and was of fair complexion. His occupation in New Zealand was Farmer. A medical examination declared him in good health. He had a scar on the outer part of his right eyebrow. He was single and his address was noted as Canvastown, Christchurch. He named his brother Frank Gilderoy Batters as his next of kin. Frank had also enlisted and sadly died of wounds received in action in 1915. Frank’s story is told here. On 16th October 1914 George embarked at Lyttelton, New Zealand bound for Suez, Egypt on either the Tahiti or Athenic. On 12th April 1915 he embarked at Alexandria for the Dardanelles, and on 11th August was admitted to the Hospital Ship Ascania. Later the same month he was admitted to New Zealand General Hospital in Cairo with gastro enteritis and pthisis (tuberculosis). In the opinion of the Medical Board, George contracted tuberculosis on active service due to exposure. The date of the original disability was listed as 10th July 1915. It was recommended that he be sent to England and on 8th October 1915 he was admitted to Clearing Hospital, Eastleigh in England. On 15th November 1915 his present condition was described: He has been complaining of pain at left apex of lung and lower part of right lung. Patient spits fairly freely. Sputum contains Tuberculi Bacilli. Sweats at night. He has lost weight since joining the force. Tuberculosis was diagnosed and it was recommended that he be discharged as permanently unfit by the Officer in Charge of Hospital. On 29th January 1916 he was invalided to New Zealand from England on SS Arawa and struck off strength. His brother Frank, who had been his next of kin, had been killed in 1915 and George then listed as his next of kin, Miss Tickell, 105 Riccarton Road, Christchurch. She was his fiancee. His final discharge came on 14th March 1917. ‘Discharged being no longer physically fit for War Service on account of illness contracted on active service.’ His address on arrival home was Cashmere Hills Sanatorium where he later died on 8th March 1920 aged 29. George was awarded the 1914-15 Star, the Victory Medal and the British War Medal. The 1914-15 Star was sent to 105 Riccarton Road, Christchurch in January 1920, his fiancee’s address. From the Probate Calendars we know that George left £1305.